Get Crabby with us this month for our Alf's South Devon Crab Celebration!! Crab Throwing...How many can you get into the crab pots?! Spot the Crabs...How many can you find?! We'll have some tasty lunch platters with South Devon Dressed Crab, South Devon Crab sandwiches & South Devon crab and locally smoked salmon salads. 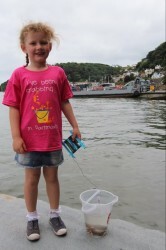 ....And don't forget to pick up your Alf's Crabbing Guide, with all the top crabbing tips from the Alf's Crew! Don't forget to upload your crabbing photos to Facebook, twitter & Instagram with #alfscrabs for the chance to win prizes!! Don't forget to join us on Tuesday 1st August, from 2pm - 3.30pm, when we are joined by the South Devon AONB who will be bringing their microscopes along so we can explore all things crabby!! Followed by crabbing along Bayards Cove.